Will the case of a young girl's death in Lahore be treated as an isolated case or will it lead to formulation of standard guidelines, practices and penalties? The death of three-year old girl Imanae Malik, due to alleged criminal negligence shown by the staff of a private medical hospital in Johar Town Lahore has shaken every individual. According to the statement of the father, the girl, the only child of her parents, was brought to the facility called Doctors Hospital for treatment of a burn on her hand. The emergency staff present at the scene administered her three injections to soothe the pain that proved lethal, to quote the statement. Long before terrorism and computer became household terms, a boy from some faraway village in Punjab came across an Urdu magazine that carried a piece on Pakistani art. The boy read it, perhaps his first introduction to Pakistani art in printed form, and was intrigued by the person who wrote it and made the art pieces which were illustrated alongside the text. After trying hard, he finally found out the author lived and worked in Islamabad. He bought a ticket for the now defunct Government Transport Service bus and six anxious hours later, he reached the capital. Once in the city, he managed to locate the painter's residence. During this meeting he asked naïve, rather silly questions about how to create good compositions, the method of preparing canvas and what is required to become a painter. The artist, showing unmatched patience, answered all these queries, tried to guide the young person and showed more works by pulling out large canvases from his studio situated in his garage. A show of work by alumni at an art college is perhaps less reflective of the ethos and vigour of an institution than a degree show, although some may argue otherwise. How students grow into their professional lives is sometimes determined by the choices they make and the circumstances they encounter rather than innate talent. The annual Alumni Show at Indus Valley School of Art and Architecture, the second one running, presented a burgeoning body of work and it must have been gratifying for the faculty to see their efforts bear fruit and flourish. But there was an anomaly here that did not go unnoticed. One of the first criteria -- that of consistency -- has been lacking in the festivals and other occasions held by various public sector and private bodies. Rafi Peer Theatre Workshop (RPTW), in holding the 8th National Youth Performing Arts Festival initiated since 2001, has been successfully meeting this first criteria despite difficult circumstances. This is not the first case of its type where medical negligence has cost a patient his or her life, or resulted in a permanent disability. But what is different this time is the course of events that followed. In the past, the standard response would have been a protest launched by the aggrieved family, followed by suspension of the accused and initiation of a probe into the incident -- and in most cases a strike called by the doctors' community against their "victimisation". Within days a victim's family, already reeling from grief, would get fed up with the tedious process of appearing before inquiry committees, recording statements and withdrawing their complaints. The general perception about the logical outcome of the inquiry into Imanae Malik's death was not much different from this. But what followed is totally different from what was expected. The way the government has conducted inquiries, the administrative machinery has conducted raids on the hospital and made arrests is something unheard of in the past. No doubt the initiative taken by Imanae's parents, judicial activism and the role of media had a lot to do with the fate of this case. The question pertinent at the moment is whether this incident will be treated as an isolated case or will it lead to formulation of standard guidelines and practices and penalties in case they are violated again. Pakistan Medical Association (PMA)-Equity Group President Dr Saghir Baloch is of the opinion that the accountability mechanism is already in place. He tells TNS that the case of Imanae Malik does not fall in the category of professional negligence. "It is a case of criminal nature as the administration of Doctors Hospital had deputed a non-technical and non-qualified person to treat emergency patients." Dr Baloch says the Doctors Hospital administration is being taken to task for the reason that it committed a crime by allowing an unqualified person to play with the lives of patients. He says had the injections been administered by a specialist doctor, PMA would have held a proper inquiry and given a chance to both the accused and the aggrieved to establish their point. The council has taken action against several negligent doctors including a professor of surgery who had no option but to leave the country, he says, adding: Pakistan Medical and Dental Council (PMDC) does not favour accused doctors in inquiries. Dr Baloch says the negligence of a doctor has to be proved before a penalty can be imposed. On the other hand the accused is not liable to punishment if he is able to establish that he committed the act in good faith, he says. He tells TNS that PMDC has even asked for postmortems in certain cases. Similarly, it can ask for medical records related to cases in questions from hospitals that are bound to keep it updated. Dr Baloch suggests that professors of government medical colleges should be barred from practicing in private hospitals. "It is a common practice that they hire the staff of government hospitals, including house officers, for their private hospitals on lower salaries. These staffers are overworked and disinterested. They have no option but to obey their bosses," he adds. "Injection Pavulon is used for induction of anaesthesia for those patients who are to be put on ventilators during operations; it was criminal to use it in case of a three-year-old child suffering from simple burn. In fact this drug is used for relaxation of respiratory muscles; hence administration of this drug was not at all justified." As the outcry on the incident gained momentum, Doctors Hospital had to hold its staff responsible for the death. The announcement made by the in-house inquiry committee of the hospital stated: "This enquiry has shown gross medical negligence on the part of on-call pediatric doctor, Sandip Kumar in the treatment of this youngster. Following this initial enquiry, all the involved doctors even remotely associated with this case have been suspended. All relevant hospital records and above mentioned enquiry report has been given to the Investigation Officer of Johar Town Police Station. Since police is investigating, any further comments on this may jeopardise an independent enquiry." Another practice that should be checked, says Dr Baloch, is the non-supervision of house officers in emergency wards. He says, under the rules, house officers have to be supervised by senior doctors and are barred from even writing a prescription till they have six-month experience -- "Unfortunately, fresh house officers are treating serious patients in emergency wards." Former Additional Prosecutor General Punjab and ex-member Punjab Bar Council Nasiruddin Khan Nayyar Advocate tells TNS that negligence is culpable under the law. "Indemnity is only for acts done in good faith by applying maximum care and caution," he says. He adds surgery is an act done in good faith and is different from criminal assault for the reason that extreme care is taken with the main purpose to cure the patient. So, even the acts done in good faith without taking extreme care are culpable. Nayyar says a surgeon who starts an operation without administering anaesthesia to a patient is guilty of professional neglect. Similarly, if a patient under the influence of anaesthesia leaves the room without doctors' permission and suffers an injury then both the doctor and the patient are responsible. Commenting on a decision by a District Consumer Court in which an accused doctor was asked to pay hefty compensation to an aggrieved patient, he says, the ruling is not binding on other courts. "Till the time a superior court does not interpret this law and categorise medical doctor as a service provider there will be no binding effect on other courts. The scope and extent of a law is defined by the superior courts and the process may take decades to complete." Punjab health department spokesman Additional Secretary Dr Mushtaq Ahmed Salariya tells TNS this case is different in a sense that the aggrieved family has not given up. He says the family, which has returned recently from abroad, is well-aware of the rights of patients and liabilities of medical professionals in case of criminal negligence. "The way they highlighted the issue and involved the mass media and other means of communication to spread the word made it impossible for the hospital management to hush up the affair." In response to a question, Dr Salariya says this time the doctors' community also refrained from opposing the move as it was very difficult for them to trivialise the issue. "It's hard to tell someone, who has lost a dear one, to forgive the culprits." He says the same doctors who had joined hands to protest against the proposed Punjab healthcare bill did not take it as an assault on their fellow professionals. Dr Salariya is hopeful that this particular case will raise awareness among masses about their rights and warn negligent medical practitioners of dire consequences if they do not treat their patients seriously. He says many inquiries launched in the past could not go beyond a certain point as the aggrieved families withdrew in the middle, terming the incident a will of God. He also rejects allegations that the Doctors' Hospital administration is politically victimised by the Punjab government. "Had it been the case, Dr Faiza Asghar, the managing director of the hospital, would have been removed from the chairpersonship of Child Protection Bureau. She is still holding the post which was awarded to her by the previous government," he adds. This was the first encounter between the person who is writing these lines in Lahore and the man who died last week, on Dec 3, 2009, in Islamabad. I still remember Ghulam Rasul's serious yet pleasant face when he talked about his work and explained various dimensions of art that afternoon many years ago. After seeing his paintings first printed in the monthly Al-Saif (August 1976), I kept discovering his canvases again in the Lahore Museum, Alhamra and other galleries. What impressed me was the unusualness of those landscapes, which 'showed' fields, trees, mountains, buffalos, haystacks and huts. But there was something extra that turned these medium-sized surfaces into extremely attractive visuals. Here were pictures that compelled a novice like me to keep looking, discovering, and enjoying the detail of imagery and different shades of colour. It was then that I realised how the experience of reality can be converted into a lasting reality of experience. Analysed in the tone of an art critic (not exactly a comfortable voice most of the time), the work of Ghulam Rasul from that period (1975-1980) was the most impressive example of dealing with a typical subject -- landscape -- and devising and developing an extraordinary mode of expression. A blend of aesthetic elements from Persian miniature, Post-Impressionist palette and Hard Edge painters of United States, it displayed a definite and identifiable mark of being Ghulam Rasul. Who was that Ghulam Rasul? In order to answer this question, one needs to find the origin of the painter, and the phenomenon that transforms an ordinary man, may be from a humble rural background, into one of the leading painters of the country. An aesthete who carved a distinguished place for himself based upon his unique but short-lived style of constructing unusual compositions in flat colours. In fact the question as to why he could not carry on with the same language and vigour in his later years holds some importance, but in a sense it is insignificant too. Because if an artist is able to create a body of work -- in the span of a few years -- that is original, exceptional and exciting, he is much superior and relevant than those who spend their lives fabricating images which are repetitive, derivative and plain boring. But usually artists, even those who once had the capability to create 'new' works, hardly acknowledge the fact that their glorious phase is over, and now what they make is just in the memory of their early success. Similar was the case with Ghulam Rasul, who continued painting till the end of his life, but was unable to reproduce or surpass what he did in the seventies. This fact, when brought up in an article, drew an unkind but mild, civilised and rational response from the painter). However, Rasul was always busy painting, trying to reinvent himself, by changing his views, extending his vision and shifting his locations. 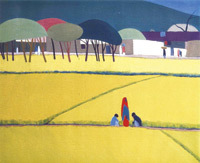 He spent a number of years lately in painting scenes of Northern areas of Pakistan with other artists. But along with the work relationships, Ghulam Rasul maintained warm and friendly terms with as many as possible, inviting artists to join him in the evenings at his house, corresponding with them and regularly sending messages of Eid greetings and Happy New Year. The way he managed to keep close ties with his contemporaries, even if they differed from his opinion on art or life was a reflection of an unpretentious, imaginative and intelligent man from a small town. Writing an autobiographical piece in Maah-e-Nau (October 1978), Rasul recalled his early years with his family at a military dairy form: "When I came of age, I found myself in an environment, which was situated between village and city…….looking at the green fields, crops, men at harvest, cows, buffalos, bullock carts, hence everything whether living or object, which was connected to farmer, field and village was closely observed, and I was able to see nature closely". On his art he adds: "I studied Japanese prints, Op art, Gauguin's paintings, Mughal miniatures and Behzad's work thoroughly. I already had my subject matter, so by recollecting childhood memories and images of my land and people, I created a distinct style in which flat colours were used extensively, so that the painting had a strong impact on the viewer". 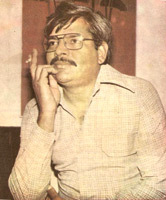 The sense of being down to earth, evident in his writing on his own work/life, is also highlighted by Mustansar Javed, in his contribution to Urdu magazine Dhanak (April 1975). He discusses the cultural connotation of his choice of retaining the name Ghulam Rasul, and not modifying it into something chic, like G. Rasul or even Rasulgee, and how this small detail denotes his link to his environment and temperament. For Rasul, not only were the great expanses of green fields important for him, humans held a much higher position in his worldview. So even though man does not appear prominently in his paintings, the same warmth and vividness of hues visible in his landscape was offered to his friends and fellow artists in life. And even to completely unknown persons, like the novice who travelled from a faraway village to meet him in the late Seventies, and then became an artist himself. All these people who knew him are shattered to hear the sad news of his death. The titles of the works contained names, the department they graduated from and the year they graduated in, along with their present pursuits: Aamir Habib, Fine Arts, 2002, working with DawnNews as set designer. Beenish Waiz, Fine Arts, 2002, currently Art Director/Production designer, specialising in art direction for TV commercials. Ehtesham Ansari, Fine Arts, 2007, working for event management and production company. Leena Ahmed, Architecture, 2000, teaches tabla and piano after having completed a four-year tabla-learning programme under an Ustad in India. Manizhe Ali, Fine Arts 1997, Filmmaker. Omar Kasmani, Architecture, 2001, recently completed Masters' in Muslim Cultures, aspiring anthropologist. Sara Baig, Architecture, 2003, event designer, photographer. Zaid Hameed, TextileDesign, 2007 ceramist with a particular passion for Hala pottery. The topping on the cake seems to come from Ali Alam, Architecture 2001, an ardent musician and a band member who states: "I started painting three years after graduating from Indus Valley… Somehow, painting, more than anything else, takes me back to that time. A time more free of care." If readers are wondering at the confusion of students spending four or five years in an institution pursuing a career and then abandoning it once they leave school, it was a deliberately elicited response on my part. Indus Valley has groomed the artistic sensibilities of these young adults. It has facilitated them in the act of informed appreciation and enabled them to grasp the lode of art no matter where it may be found. In short, it has achieved at least in these cases, art's objectives of being interrogative, exploratory and investigative. The education these students have received has provided them the ability to discover the manifestations of the creative spirit in places where the uninformed mind would not search. In this context, all the work we see in the Alumni Show becomes relevant without drawing up unnecessary paradigms of discipline or learning. Among the ranks of the artists was Adeela Suleman, Pakistan's prominent installation artist, duly recognised in Pakistan as well as abroad. Also Sheherbano Hussain contributed to the show by exhibiting two paintings. Among Fine Arts graduates turned media/production specialists, Manizhe Ali produced a quirkily humorous installation called 'Fannee Kharabee', in which she developed the image of the multi-hued stripes visible during a test transmission on television into a three dimensional object. Beenish Waiz created a poster that revealed the tricks used by production managers during the shooting of commercials, while Amir Habib's work was sensitively illustrated. Sausan Saulat, a recent Fine Arts graduate, exhibited a series of small canvases that addressed the ennui and languor of young people suffering from surfeit rather than scarcity. The architects showcased some of the projects they have worked on in their developing careers. Young architects like Ramiz Baig, Moyena Niazi and Fawad S Abbasi have already created buildings of stature, including viably aesthetic residences and customer-friendly retail outlets. Ali Alam displayed a charming acrylic on canvas painting of a building, in loud, unabashedly bright colours. A ponderous yet playful installation came from one of Indus Valley's most talented architects Omar Kasmani in which he developed an idea emanating from a photo cache of a malang at a local shrine who is seen fiddling with a handy cam. The Photography department of the Indus Valley is indisputably one of the finest in the country and the proof was in the pudding: Momin Zafar's photos depicted dust swirls with people in the background, as were Umer Adil's stark images of rural women that portrayed them as stalwart and heroic, not lowly or inconsequential. Works by the talented husband-wife duo Farzad Bagheri and Maria Jamil were exemplary and outstanding. Bagheri's visual rendering of a man's bent head combining photography and computer graphics created a compelling effect of austere and vivid starkness. Jamil's voyeuristic journal took us on a pictorial journey through the meandering lanes of her experiences; a compilation of some of the most charming pictures accompanied by unselfconscious texts. It was ironic that the Alumni Show opened at the same time as the graduating class displayed their Degree Show. Surely it must have provided fresh graduates with an insight into their future, while offering the alumni a nostalgic reminder of their Halcyon days at school. In the other festivals held so far, like those by the Pakistan National Council of the Arts or the Lahore Arts Council Alhamra, inconsistency has been a major failing. Since festivals have not been held regularly, they lose their critical edge. But this organisation till now has not faltered on this count. It is at the peril of repetition that one states again the tough conditions that have bedevilled the normal activities in the country. The security conditions and the drying up of the sponsorships have been the two major causes -- though traditionally these have not been the only ones. Setting out to stage an event, particularly in the field of culture, always raises hackles -- from its moral concerns to its relevance to our religious values to the non-availability of resources. Previously in Pakistan the biggest constraint used to be financial because there were hardly any sponsors and the government was for ever reluctant to promote the arts. But now it seems that the question of security has assumed far greater importance. Security does not only concentrate or consist of security to the people in the artistic and management areas but it impinges on the overall law and order situation of the country which in turn affects the economic condition of society. The festival was compartmentalised in three parts -- theatre, music and dance -- with many institutions participating in the three as they had done in the past. To the initial surprise of many the Engineering University had always put up a vibrant theatrical performance. This year the UET Dramatic Society's Anwar Latif Kaun Hai was a spirited performance based on the chaotic lifestyle that characterises our daily existence. It also provided the comic aside as the main character struggled to gear himself up for an important meeting which was to have a bearing on his future. The Alif Adab Society of National College of Arts was as always very comfortable with the visual presentation. Their play Tingg was a combination of mime, drama, dance, music and other experimental techniques meant to explore the limits of a visual presentation. Natak of the University College of Art and Design Punjab University too has been a consistent participant and they have been quite remarkable in their tenacity despite all the odds. Their Awey e Awey was a kind of a spoof on this society. The UMT Dramatic Society play was about a robot that sooner than expected started to assume human emotional qualities. Pakistan Studies Forum was a farcical aside by placing the great builder Shah Jahan in contemporary times. The play by Kinnaird College for Women was about the present conditions in the country as it yearned for peace, security and hence creativity in the midst of blasts, deaths and destruction. The Lahore Grammar School Senior Section Gulberg produced Taleem e Balighan, the classic Urdu play which has been done many a time by various groups, professional and amateur. LUMS play Shikwa was about the travails that the Palestinian people have had to endure in the last six decades. Department of Music College of Arts and Design presented a mime of a musical performance. An encouraging development in the past few years has been the emergence of numerous bands and groups that take their music very seriously. Most of these groups comprise boys and perhaps girls, who are very young, some in their teens, practice and perform regularly. Most of them are self-taught, with no training in the playing of an instrument or in vocals but they have been very passionate about it. Their teacher or guru mostly has been the internet and by following the various softwares they have picked up the playing techniques of instruments. Probably the first generation which has been trained by virtual teachers included groups that performed in the Festival like 11th commandment, Impetus, Anarchy, V8, ACMS, Saays, Tremolo Shift, Real MC's, Free Stylers Co, O Gravity, Pineapple Rapple Snapple, Hit the Ground Running, Suicide Note, Amphis, Gulab Jammin, Odyssey, Yoorish, 86 Age, Preaching Hypocrites, Medical Rejects and Ensign. There were two dance performances one by Umair Atif and the other by the shagirds of Nahid Siddiqui. In the latter the vocal music was by Nahid Siddiqui, Fareeha Zafar and Hassan Mohyeddin on the tabla made an impressive statement. Lighting candles in memory of the World Performing Arts Festival that never took place -- a resolve that the activities will resume full time the moment the security situation improves even slightly, rounded off 8th Youth Performing Arts Festival. A very spirited performance by Sain Zahoor totally expressing that resolve was the ceremonial finale to the festival. This time round, too, the RPTW decided to host the festival in their own premises that houses the Puppet Museum and Peerus Café and not at the Alhamra Cultural Complex where most previous events have taken place. In making a couple of makeshift stages, the performance area was increased and it can be expanded further if there is need for more in future. In the vast expanse of the acquisition, it was an event away from the humdrum of downtown existence, a very nice peaceful location but for ordinary persons who do not have their own transport still a little hard to access. The city has almost encroached upon it in the twelve odds years since the project's foundation stone was laid and is almost there.